Thanks for that recipe, I’ve copied it into my word processing files for a taste test later! Love your pictures. And the ones in the posts with the deer and the spider webs too. I hope I have the right Pink Saturday post..and it’s a lovely one. 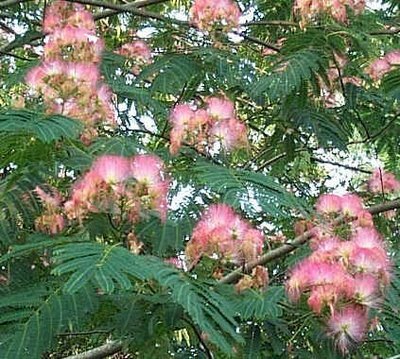 I also love the pretty pink of the Mimosa.. I can’t imagine those that don’t. Anything that pink and that fluffy has to be a good thing. Happy Pinks and wishing tou a lovely week. Your Mimosa is beautiful. It always makes me sad when someone refers to a tree as being “dirty”. Trees are such a delight in so many ways. They cool in the summer, protect us in the cold months. The add beauty and live many years in our gardens. If one wants a “clean tree” then buy an artificial one. For me, my trees are like old friends and I consider it an honor to clean up after them. What a pretty, fluffy tree. And I support mimosas whole heartedly… yummy! Happy Pink Saturday. Beautiful mimosas! Christi, I don’t think I’ve ever been here, sugar, but I DO know I’ve never seen a tree like that! It’s gorgeous. Looks like a fan. Nice to meet you, chickee, and happy pink saturday. It was nice to be featured sisters. Happy Pink Saturday, Christi. I hope you are enjoying being one of today’s featured blogs. 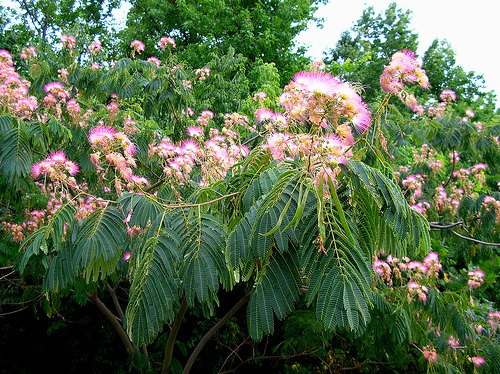 I love mimosa trees, and I have always loved them. It is just not right to dislike something so pretty. Have fun at your festival this weekend. From one southern lady to another…. I think they are beautiful! Beautiful pics too! Man, you don’t have to defend them with me! I love them. Don’t have one, but I love the feeling they give me! Happy Pink SAT! Happy ps, I love mimosa trees! I have three now around my house. They are just teenagers – about that height. They are a lot of fun to watch, and provide excellent shade. Did you know the leaves close up at night? How special is that? Mimosas? Count me in my friend! Hi there cutie– what a fun post! I have never had the opportunity to see one of these trees out west… but i would imagine they would be held in the same catagorie that our “cotton” wood trees are… while yours are beautiful to look at …our cotton woods just shed the white fluffy stuff and what a mess! Nice to be featured with you this week on Pink Saturday… stop by and say hi and join us on Fridays as we celebrate the beauty around us. Yes, I love them, in someone else’s yard. 🙂 We do have them in the woods surrounding our yard and they are lovely there too, but we try to keep them out of our yard. Beautiful but very messy. Those trees are so pretty. We don’t have them here where I live. Makes a pretty pink post for Pink Saturday. Thanks for sharing. 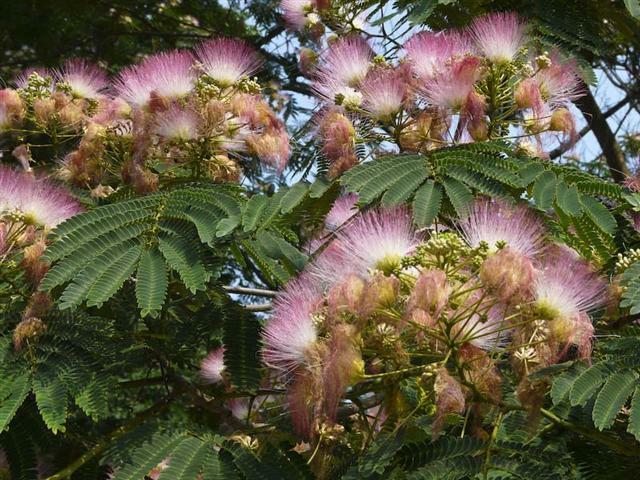 Just looking at photos of Mom’s mimosa! Love them! Off to sip mimosas and visit more Pink Saturday blogs! CheerS!!!! 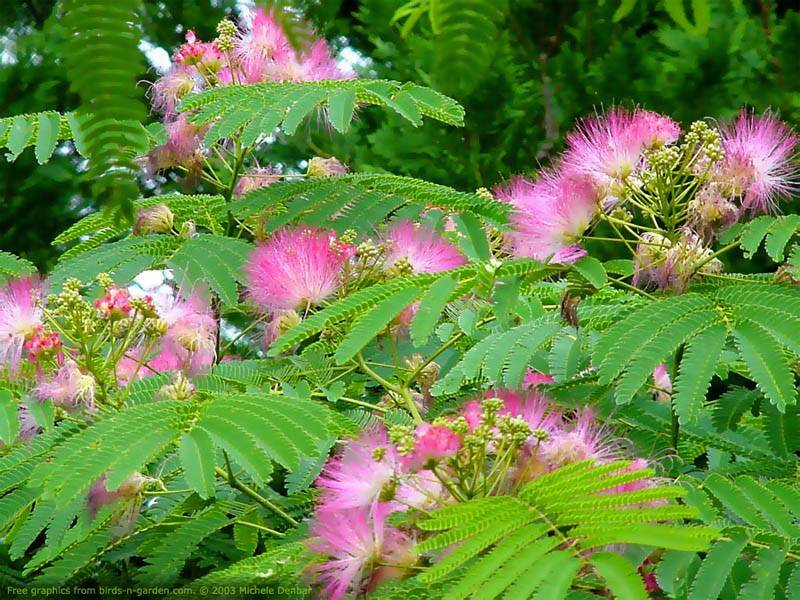 Hi Christi, came over here from Beverly’s..love the mimosa tree, we used to have one at our old house, I loved to sit unde that umbrella of shade, and yes it made a mess, but a good mess. We live in Southern CA so they do grow in the west also! Have a wonderful week and stop by if you get a chance! I love these trees! Growing up in Puerto Rico, we have them year around. I’ve always loved the pink fluppy flowers. Thanks for bringing back a childhood memory! I LOVE THE MIMOSAS TREE. MY HUSBAND HATES THEM. THEY REMIND ME OF MY CHILDHOOD. 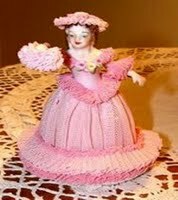 WE USE TO MAKE DOLLS OUT OF THEM AND PUT THE FLOWERS IN OUR HAIR. I LIVE IN OKLAHOMA AND YOU USE TO COULD SEE THEM ALL OVER TOWN IN THE 60’S AND 70’S BUT NOT SO MUCH ANY MORE. Christi ~ I agree, I think they are beautiful. Is it the pink puffs that make a mess when they fall to the ground? Do they only grown in the south? Thanks for sharing with us. Happy Pink Saturday!